Our new cashier tables are constructed from heavy-duty 18 ga. galvanized steel for sleek styling and easy cleanup. These strong, attractive tables feature simple assembly and can be bolted together in different configurations to fit your needs. Built right here in the USA from sturdy galvanized steel for years of use. The CH8100 is really two tables in one! 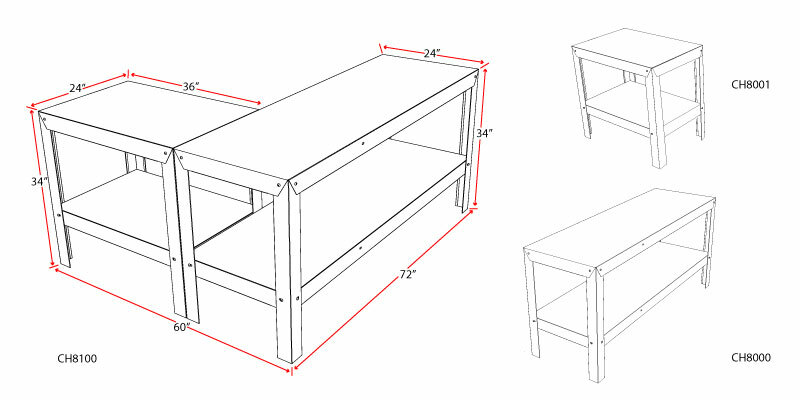 You can order the CH8000 (24” x 72”) and the CH8001 (24” x 36”) tables separately or as a unit that can be assembled either left or right facing! This display features straight-forward setup with standard tools along with an easy to follow manual. CH8000 - Cashier Table 24" x 72"
CH8100 - Cashier Table 24' x 36"
You can download the setup manual below along with other helpful files. You will need the free Adobe Acrobat Reader to view these files.